Welcome to my increasingly adequate website. I used to greet visitors to my site with this: "You won't find much here yet, and maybe you never will." By now I think it's a safe bet that you'll never find anything particularly important here. Still, it's nice to have a bit of cyberspace to call one's own. I'm using this space to say a little bit about computers, computer games, and a few other things I'm interested in, like history or politics. 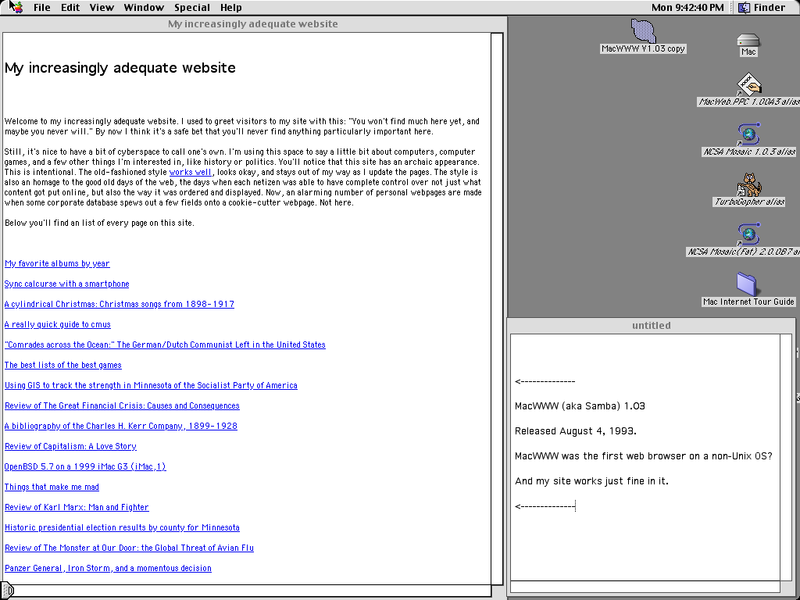 You'll notice that this site has an archaic appearance. This is intentional. The old-fashioned style works well, looks okay, and stays out of my way as I update the pages. The style is also an homage to the good old days of the web, the days when each netizen was able to have complete control over not just what content got put online, but also the way it was ordered and displayed. Now, an alarming number of personal webpages are made when some corporate database spews out a few fields onto a cookie-cutter webpage. Not here. Voting: not just pointless, but harmful! To the extent possible under law, this author has waived all copyright and related or neighboring rights to this website. This work is published from United States. Page updated 04 November 2018 (see changelog for all changes). Send email to schalken at warpmail dot net.